As it’s World Gin Day and I’m partial to a little Mother’s Ruin, I thought I’d share with you some of my favourite Gin Joints. As you know, blogging and writing takes me all over the world so I have a little collection in my widespread list of ‘Favourite Haunts’ and one of the criteria in order to make the grade, is a decent selection of gin and also bar staff who know how to handle them…..
1. Barrio Central, 6 Poland Street, London. Barrio Central’s neighbourhood is inclusive of anyone with a similar mindset rather than geographic locality. A love of music in all its worldly genres, an appreciation of upcoming musicians, artists and urban poets, combined with an appetite for food and drink sourced from all corners and served how they should be. With a huge variety of gins, the Barrio Central Bar Wizards will be happy to whip you up a Barrio Club cocktail – a smooth concoction of gin, gin liqueur and fresh raspberries. Definitely worth a visit next time you’re in the capital. 2. Pleased To Meet You (PTMY), High Bridge, Newcastle. Marketed specifically as a gin bar, PTMY is nestled in uber cool High Bridge, a cobbled street tucked away from the main shopping area of Newcastle and home to numerous retro and vintage shops. With a distinct deco-cool feel, the bar has exposed sandblasted brick walls and floor to ceiling bi-fold doors which open out on to the street extending the bar’s capacity during Summer. With a selection of over 80 gins from around the world, the bar staff at PTMY will be happy to guide you towards something based on your tastes, in fact, there’s a whole menu dedicated to gin so left to your own devices, you could be there a while before you finally settle on something. 3. The Portobello Star, 171 Portobello Road, Notting Hill, London. The Portobello Star is a real gem, with it’s own ‘Ginstitute’ this bar’s dedication to gin knows no bounds. With the aesthetics of a typical urban London bar, it’s set up for dining too and is rumoured to serve the best brownies in town. The Gin Menu, crafted by Jake Burger, is based on barkeeps bible; The Bartender’s Guide by Jerry Thomas and encourages customers to look at different ways to drink gin, rather than just with plain old tonic and ice. This place is known as a bartender’s hang out (yes, it’s that good), it’s a little off the beaten track if you’re a tourist in London but well worth a visit. 4. PDT (Please Don’t Tell), Crif Hotdogs, Manhattan, New York. 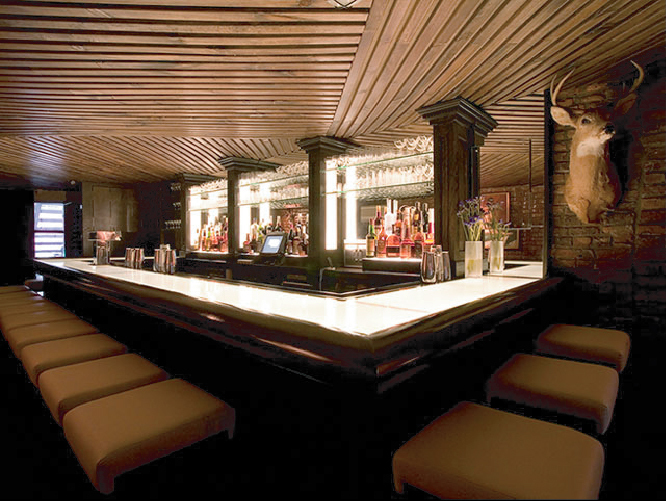 A good old fashioned speakeasy in the heart of the East Village, I was told about this place a long time ago and assumed it was an urban legend but sought it out during my downtime at New York Fashion Week last year. Only accessible via a fake phone booth in Crif Hotdogs, PDT is very much a secret that all the cool kids are in on. Once inside, the lounge is small and cosy with one of the most liqueur heavy drinks menu I’ve ever seen. The added bonus here is that you can still order from the hotdog menu once you’ve made it through the secret entrance. 5. Mai Tai, Son Bou, Menorca. The Mai Tai is a typical Spanish bar located in the heart of Son Bou, Menorca. There’s a sign above the bar which claims that the worlds best gin and tonic is served here and when you see owner Leo in action, you’ll understand why it might just be true. Order a gin and tonic here and you get table service from the Mai Tai Gin Cart, Leo makes each one himself and it’s like watching an artisan at work. The resulting gin and tonic is served in a gigantic fishbowl glass (probably the equivalent of four gin and tonics in the UK) and is garnished with fruit and herbs. A real spectacle and the hospitality here is amazing, if you find yourself on the island then it’s an absolute must visit. 6. Waynes Bar, Rue Prefecture, Ville Vieux, Nice, France. Not strictly a gin bar, but the staff there know their way around the spirit. Nestled in the busy Old Town of Nice you’ll find this amazing London themed bar, dedicated to music and entertainment, all the greats have performed here, including The Rolling Stones. Think of it as the French Riviera’s answer to Nashville’s Bluebird Cafe. definitely one of my favourite bars in the world, there’s live music here every night and some of the bands who play here regularly have a real cult following meaning that Waynes bar is without a doubt, the busiest bar in Nice and probably the Cote d’Azur. In fact, regular performer David Zincke is one of my best discoveries since we started visiting Nice, his music is definitely worth checking out. 7. Nightjar, 129 City Road, London. Quite possibly one of my favourite destination bars in London and consistently voted as one of the best bars in the world. Nightjar is always busy however it seems that it’s still a bit of a cult secret in London. Situated in the uber cool East End between Shoreditch and Old Street, Nightjar is a little slice of traditional old school glamour. Set up as a speakeasy, every inch of detail pays tribute to the prohibition era from the styling to the uniforms and even the live swing music. The cocktail list is endless and gin is the house specialty (obvs) with a huge selection on offer. Drinks menus are divided in to ‘eras’ including Pre-Prohibition, Prohibition and Post War as well as having a dedicated menu for Nightjar Signatures. Out in the far end of zone 2, if you live in London or have a few days there then make the visit, you can thank me later. That’s my list (for now anyway), who knows I might just update it as I’m on my travels and I’m always happy to take recommendations, particularly on any amazing speakeasy style bars. I’m off to pay tribute to World Gin Day with an invite to C.O.L.D London to not only drink gin but to distill my very own bottle, so whatever you get up to today, enjoy it and feel free to sink a gin on my behalf, I know I will….